An illustration of the proposed football complex, which will house a Bill Walsh tribute. Originally appeared in the San Jose Mercury News on Feb. 24, 2011. An illustration of San Jose State’s proposed football complex, which will house a Bill Walsh tribute. San Jose State is planning an unprecedented upgrade of its athletic facilities, including the construction of a football complex next to Spartan Stadium that would feature a tribute to Bill Walsh, the Mercury News has learned. In all, five athletic projects are in various stages of development with a total estimated cost of $16 million to $20 million. At least one could be used by the public, and all would be privately funded and built on the South Campus land owned by the California State University system. Six of San Jose State’s rivals in the Western Athletic Conference (Utah State, New Mexico State, Idaho, Hawaii, Nevada and Fresno State) have built new athletic facilities since the completion of SJSU’s last project, the Koret training center, which opened a decade ago. 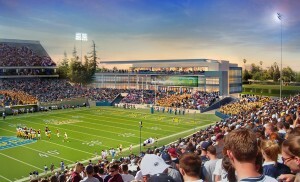 SJSU hopes to break ground on the $10 million football building after the 2011 season. The 19,000-square-foot facility would sit just beyond the north end zone, providing a bird’s-eye view of the field from a second-floor patio. 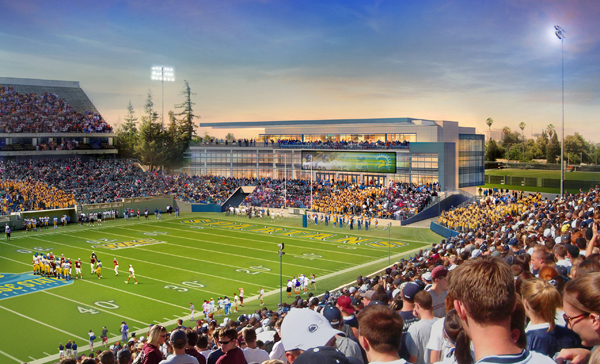 SJSU is planning to install a state-of-the-art scoreboard in the stadium, possibly in time for the 2011 season, and build new football practice fields in the summer of 2012. There are also plans for a $3 million to $4 million field house. Built on South 10th Street, it would feature a multipurpose floor and could be rented out to high schools and community organizations. The facility upgrades would be paid for by private donations to the university’s $200 million fundraising campaign, which was launched in October. Athletics is one of the campaign’s cornerstones, along with the colleges of business and engineering. Several faculty members contacted by the Mercury News, including professor Michael Kaufman, chairman of the Academic Senate, declined to comment on the athletic department’s projects — all saying they were unfamiliar with the specifics of the university’s financing plans. The second floor would include offices for the football staff and a large meeting room that could play host to functions for donors. The patio would look down on the north end zone from just beyond the stadium’s north bleachers. The football program currently shares the Simpkins Center with the athletic department’s academic support staff. When the new football building is completed, Bowen said, the Simpkins Center would be used entirely for academic support. Bowen declined to state how much of the projected cost of the football building would be needed upfront — the school is in the process of securing a lead donor — but a source said the figure could be as much as 50 percent. The athletic department has balanced its budget four consecutive years, Bowen said. Read Jon Wilner’s College Hotline at blogs.mercurynews.com/collegesports. Contact him at 408 920-5716.